One of the problems of compiling a living history is if the subject is still living, there will always be additional material to add. Add being a huge support of that subject’s work and you’re just as excited about the new stuff as finding old gems. When Phish goes on the road, I want to hear every show as soon as it’s available and since 2002, every single show has been available the next day on LivePhish.com. So, take the 3 hours it takes to hear the next historical show and combine it with 3 hours of either the previous night’s recording or attending a show and that’s a lot of Phish in one day. In reaction, I would but the blog on break until tour was over but then you lose your audience. So starting today, this blog will have posts tagged “PhishNow”, which will mark reviews posted during a current tour. Hopefully, I’ll have a review of the most recent show the next day. And being I’m listening to every show, it still doesn’t deter from the blog’s core concept I believe. So without adieu, we kick off Fall 2014 in Eugene, OR. Phish hadn’t played on a college campus since 2011 at the UIC Pavilion at the University of Illinois-Chicago. 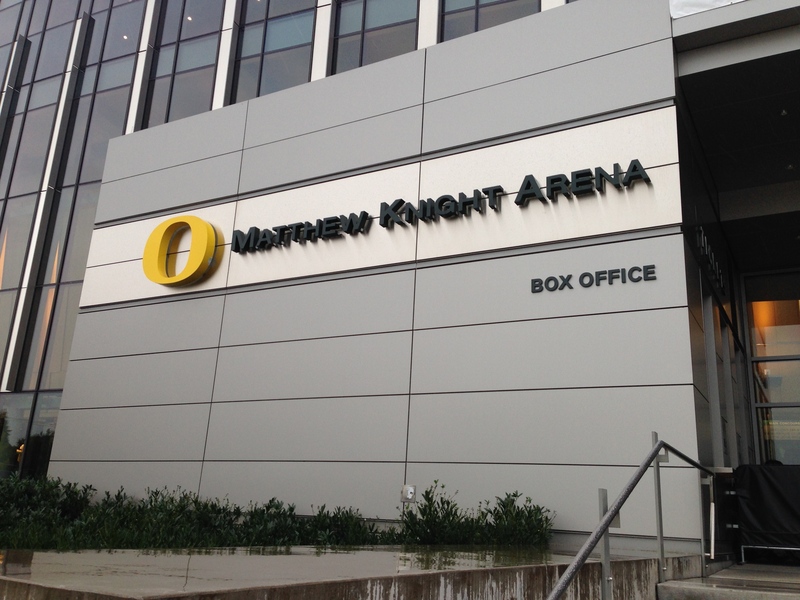 Some fans made note of this upon learning of the show at Matthew Knight Arena. They said it was interesting because from about 1990-1993, college campuses were where you were most likely to find the band. Would this lead to an old school show? Not so much but it was a fun night. I recently made the move from Boston, MA to Ellensburg, WA and found myself with the opportunity to enjoy the band’s first Pacific Northwest run (outside of the Gorge) in a very long time. In fact, the last time the band played Eugene was 1994 and the last time in Oregon since 1999. This led to high expectations. The venue itself is very cool. Named for the son of alumnus and Nike CEO Phil Knight, the arena is modern and retro at the same time. It has the metal and glass exterior but the interior reminded me a lot of the DCU Center in Worcester. Also notable was a lack of luxury boxes and the seamless transition from the lower bowl to the upper deck. It felt like a gym in all the right ways. This also helped with the show, making the space feel intimate, despite the 12,000 people inside. The show kicked off with the interesting choice of “Waiting All Night” from Fuego. As if to say “we’re in a mellow mood” without the obvious Bob Marley choice they may have used in the past, the song is one of my favorites but this version sounded a little out of sync especially between Trey and Mike, like it was just out of phase. The vocals also seemed a little flat. Adding the confusion in the space, there was a loud echo off the back wall for the first part of the set. Keeping the vibe, the band went into “Free”. Not really hard rocking, it was a fine version but still the band didn’t feel linked up, especially marked by the last 30 seconds, which were in the wrong key. The disconnect continued as the whole band botched the intro to “Poor Heart” despite Trey’s loud count-off. The tune picked up steam though and was played faster than in recent memory. “Sample in a Jar” was a rocking version and a solid anchor in this odd first set. “555” featured some dirty guitar work from Trey, recalling the 1980s. The set picked up the fumble and headed for glory starting with “Bouncing Around The Room”. Nothing notable but an overall solid version that sounded as if the band had finally linked up. They must have picked up on the cue as without pause they ripped into “Reba”. This “Reba” was on fire from the get go with a very tight composed section and the jam built at just the right speed with superb lead from Trey. I just wish it had peaked. They built it but leveled off a little too early. Still a good one. “Roggae” took the energy down a notch but the jam has great interplay from all 4 members and is a real beauty. Just gorgeous Phish with perfect coloring by each member. Looking to pick the set up, Trey launch into the riff for “Simple” and the song is well done with a very straight ahead type I jam. The breakdown at the 6:30 mark is fun and recalls the “Plinko” style as Fish pounds into the hi-hat part of “Maze” and Mike follows right along with his bass notes. the “Maze” jam really features amazing organ work by Page over huge rhythm riffs by Trey and then the opposite with Page on baby grand, building to a huge “duel” as the song peaks. It’s very nice. The set closed with the crowd pleaser “The Squirming Coil” and any sign of rust or hesitation was gone at this point as all 4 members pulled off the difficult tune flawlessly, even Trey’s sustained tones. The band then left the stage for the always glorious Page outro. Page crushed it even teasing some of “Loving Cup”. Page thanks the crowd and then the set ends. After a rocky start, from “Bouncing” on the set is really strong. Quality 2014 Phish here. Set Two was destined to kick things up a notch and Phish didn’t disappoint, leading off with “Carini”. “Carini” has brought some big jams in 3.0 but tonight was not one of them. It does reach some blissful territory and is a solid jam but not a heavy hitter. It does have a very nice segue into “Plasma”. “Plasma” is a dong taken from Trey’s solo band and featured prominently on the live album of the same name. The piece’s minor tone and funky rhythm actually fit the band well and they made a very nice run-through with a dark jam. Hopefully, it remains in the band’s rotation and isn’t just a one-timer. After the soaring “Carini->Plasma” combo, the band opted to cool down, playing the pop-friendly “Farmhouse” and the Page tune “Halfway to the Moon”. Some might deride the band for this move but I enjoyed both tunes and it was a very nice break. “Farmhouse” had a very nice lead from Trey. “Halfway” continues to improve with each performance and even with a slight sour note at the end, Trey’s finding his footing the song and adding some nice licks. “Twist” brought the show back on track building to a blissful type 1 jam with some very nice rhythm work from Trey. Again, not an all-timer but fun. “Crosseyed and Painless” is the real centerpiece of this evening though. The band hit this one out of the gate playing at a pace more true to the Talking Heads original than Phish’s usual. At the 7-minute mark, we get some serious hot pinko from Page and Trey that’s a lot of fun and it builds until it’s a full-on plinky jam delivering the band into a type 2 jam, veering away from the structure of “Crosseyed” and it devolves into a huge, sweeping ambient jam with Gilmour-esque loops and screeches from Trey’s guitar and then at 14 minutes in, the band begins with the “Still Waiting” refrain, marking it as part of “Crosseyed”. The jam drifts off into the either and we’re brought back down by the opening refrain of “Harry Hood”. While not as big as the 6 Hoods of Summer, the “Hood” jam is nice. It almost retains the groove from “Plasma” over the “Hood” chords, like the band could go back into “Plasma” at any moment. Again, as with “Coil” my problem is the song never peaked. It had a very nice jam but never reached the summit before going into the “You Can Feel Good” refrain. Trey has some very nice licks before hand but it just didn’t take me the full way. All-in-all, still a nice version. I thought the set would end there but Trey decided to call an audible and the band threw down a wild “Rocky Top” to close the set. It was an odd call to play an SEC school’s fight song on campus out west but probably didn’t think much of that. The band was clearly feeling to good energy and so instead of the usual encore, decided to play three and lead off with “Wingsuit”. This “Wingsuit” had some great Trey noodling and the always explosive finish. I excepted that to end the show but the band fired up “Sleeping Monkey” and Trey brought out the banter, proclaiming that “Monkey” is Page’s favorite song and that the band is not playing it for the audience but for Mr. McConnell. Trey and Page also dusted on the song, with Trey taking his mic off the stand and singing “face to face”. So much fun. This version also had the audience sing a chorus for Page and the Eugene crowd did not disappoint, singing in top volume. Again, I thought it would have been enough to send the crowd home happy but the band wanted to make us dance one more time with the feel good Bob Dylan classic “Quinn the Eskimo”. A fun cap to a good evening. Overall, the show had a rough start but finished strong and set a good tone for the Fall Tour. Up next, a Saturday night in Seattle.